What browsers can be used with Banner 9? Any modern browser can be used for Banner 9 (Chrome, Firefox, Safari, etc.) Ironically, Internet Explorer, the preferred browser for Banner 8, is not recommended for Banner 9. Can the Banner 9 color scheme be changed? Will Banner 9 work on mobile devices? Yes! Banner 9 works well on large-screen mobile devices like tablets and iPads. Note: Although Banner 9 is accessible from a phone, the user experience is not ideal. Does the change to Banner 9 impact Banner Self-Service? Banner Self-Service will not be impacted at this time. Only users of Banner Admin (aka Banner INB) will see a change. Banner Self-Service will be upgraded at a later date. How do I access Banner 9? Banner 9 employs a tool named Duo for 2-step verification. After you have enrolled in Duo you can access Banner from the IT Links page (itlinks.wm.edu). How do I set-up Duo (2-step verification)? Will I have to change my password every 90 days? No! Using 2-step authentication provides a sufficient additional layer of security that the 90 day password changes are no longer necessary. How do I change my Oracle password? - If you get a Session is Expired message when navigating within Banner 9, start at Step 1. - If you can navigate within Banner 9, skip Step 1 and begin at Step 2. Note: This process is also used to reset your Banner (Oracle) Password for tools like Discoverer Reporting, Toad, SQL Developer, or other database tools. Select the Banner Password Reset tab to generate a temporary Oracle password. You must first be enrolled in Duo Two-Factor Authentication to complete this step. How do I know which instance of Banner I am in? Find the blue banner at the top of the page. 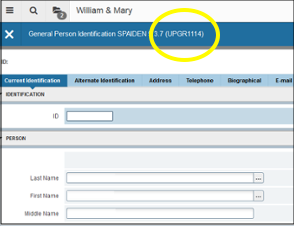 Next to the form name, the instance will be listed in parenthesis. The numbers next to the name of the instance represent the date the data was updated. Shown in MMDD format. I'm getting a "Session is Expired" message when navigating within Banner 9. What should I do? You need to reset your Oracle password. See How do I change my Oracle password? in the Access & Authentication FAQ section. See How do I change my Oracle password? in the Access & Authentication FAQ section. Why aren’t jobs that I submit showing up on the U: drive? In Banner 9 you will need to update your job submission output location as it does not carry over from Banner 8. Job submission output will need to be updated for each instance you use; PROD, USER, UPGR, etc. All job submissions should now point to the correct location on the specified drive. How do I access the Ellucian Self-Help Portal (aka Ellucian Hub)? 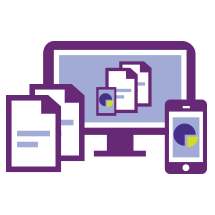 Ellucian's Self-Help Portal is open to all Banner users after registering for an Ellucian HUB account (pdf). Who do I contact for help using Banner? Banner support is available throughout campus. The nature of the question determines who you contact for support. Both technical and operational support are available. Please see the Banner Support list for details.